El Mokawloon manager Hamdy Nouh believes Mohamed Elneny should pursue a fresh challenge away from Arsenal after finding first-team chances hard to come by under Unai Emery. The Egypt international had only signed a fresh long-term deal with the Gunners earlier in the year but things have since panned differently with Emery offer him just one appearances in the Premier League. Speaking to Goal.com, Nouh, who is the head coach of one of Emery's former clubs El Mokawloon, feels the midfielder should secure a short-term loan at the least next month in order to regain his confidence. "He needs to leave Arsenal in the next transfer market, at least on loan to play more and regain his confidence," he is quoted as saying in an exclusive interview with Goal.com. 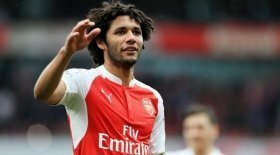 Elneny has been regularly linked with Leicester City over the past 12 months and Claude Puel's side could potentially make an approach when the transfer window reopens in a couple of days' time.